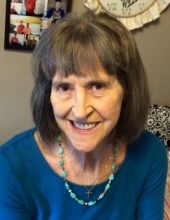 Linda Carol Taylor, 69, of Springdale, passed away January 22, 2019 in Bentonville. She was born November 19, 1949 in Eureka Springs, the daughter of Wesley Johnson and Mary Roach. She was a homemaker. She enjoyed spending her time with family, grandchildren, great-grandchildren, sewing, crocheting, cross stitching, embroidery, planting flowers and having a green thumb. She is survived by her son Michael Scott and wife Tracy of Avoca, daughter Michelle Scott Tipton of Rogers, daughter Melinda Scott Fairchild of Avoca and son Marc Scott and wife Shawna of Avoca, thirteen grandchildren and four great-grandchildren. Her family would like to extend great appreciation and love to Rocking Chair Inn of Springdale for thirteen years of great care and friendship. Also, to the Circle of Life in Bentonville for their great care and compassion. To send flowers or a remembrance gift to the family of Linda Carol Taylor, please visit our Tribute Store. "Email Address" would like to share the life celebration of Linda Carol Taylor. Click on the "link" to go to share a favorite memory or leave a condolence message for the family.